Roland Merullo, is the critically acclaimed author of seven books, including the Revere Beach Trilogy, three novels about growing up in a tight-knit community outside Boston, and Golfing with God, a novel about a man’s unexpected spiritual journey. He lives with his wife and two daughters in eastern Massachusetts. How do the first scenes of Otto with his family set the stage for what happens in the rest of the novel? In what ways does Otto change over the course of the story? What key moments during the trip play a part in his evolution? How would you describe Cecelia? Is she, as Otto says, “as flaky as a good spanakopita crust”? Is there some substance to her? Do you believe Cecelia changes over the course of the story, or do you think it’s only Otto’s opinion of her that changes? Share specific scenes that support your view. Which events or remarks in the novel convince you that Rinpoche is a legitimate spiritual teacher? Were there situations where you doubted his authenticity? Humor is often employed a way of making us relate to a particular situation. How does the author use humor in this way? Are there particular passages that were especially funny to you? If so, why? The book is partly about “meaning of life” issues, but it also has a lot to say about contemporary American society. What does Otto see and hear that makes him encouraged or discouraged about the state of American life? Discuss the role landscape plays in the story. Jeannie, Anthony, and Natasha are minor characters in the novel, but how do they serve to round out Otto’s character? How do they influence your feelings about Cecelia and Rinpoche? Amish country, the Hershey’s factory, a bowling alley, a baseball game, taking an architectural tour of Chicago, playing miniature golf, swimming in a Minnesota lake, why do you suppose the author chose these kinds of activities? Discuss the purpose each activity serves in the story. What would the book have been like had these activities not been included? When Otto comes across the metaphor of the piano-playing boy in Rinpoche’s book, he says, “If I had been editing the book, I would have written in the manuscript margins, ‘Work this,’ meaning that the author should take the general idea and sharpen it, make it clearer to the reader” (page 174). Yet Otto can’t get the the plight of the piano-playing man out of his mind. Why do suppose that is? What aspect of the metaphor is unsettling to Otto? Do you find it unsettling? If so, why? 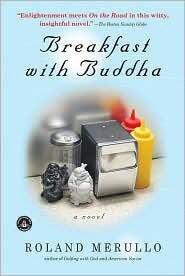 How would you characterize what Otto experiences after sitting with Rinpoche for two hours in silence (page 237)? Have you ever experienced the pleasure of a quiet mind? Was it similar or dissimilar to Otto’s reaction? Do you believe Rinpoche is changed by the end of the trip with Otto? If so, to what degree is Otto responsible for that change? Do you believe the ending of the novel was the best ending for this story? If the story were to continue, where should it go from here?